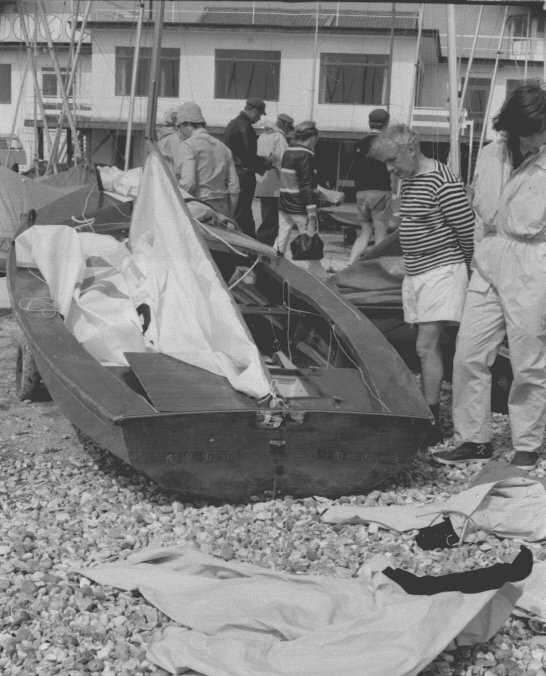 The W950 pictures from the Solent in 1974 are showing, left to right, my next youngest son, Kristian; my late wife, Mait; youngest son, Sven Henrik; and me (Ken Jensen) holding the sheet of the winged genoa; we didn't care to use the spinnaker. ... 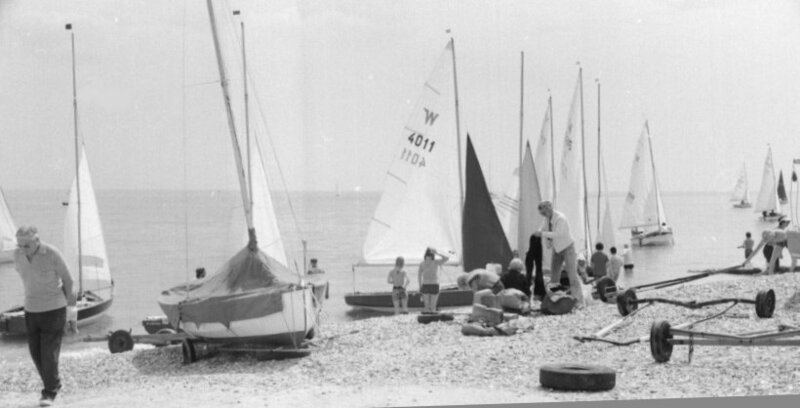 I hereby include a photo taken on the Solent in conn. with the very first 1974 W-WCh. showing my late wife (Mait), my two youngest boys and myself. 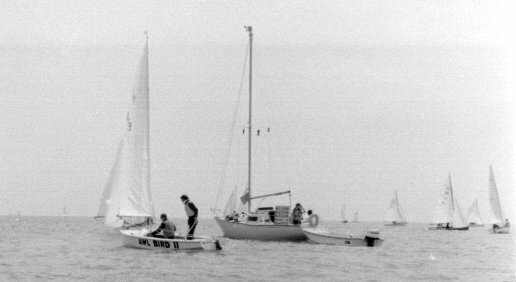 In one start amazingly we were the first W. to round the windward mark (cheered by Ian and Betty Proctor and Margaret Dye a.o.) because we were going directly for that mark, whereas everybody else were following the *good ones* tacking towards the shoreline of Hayling Island, expected tidewise to be the route to choose. Great fun - didn't last long - except in our memory. W950 was acquired from Sweden - intended for my oldest boys. Now in Denmark's Museum of Yachting in the castle of Valdemar Slot built by King Christian the IV - about 1636 (I think). The place also for the Elvira Madigan tragedy. 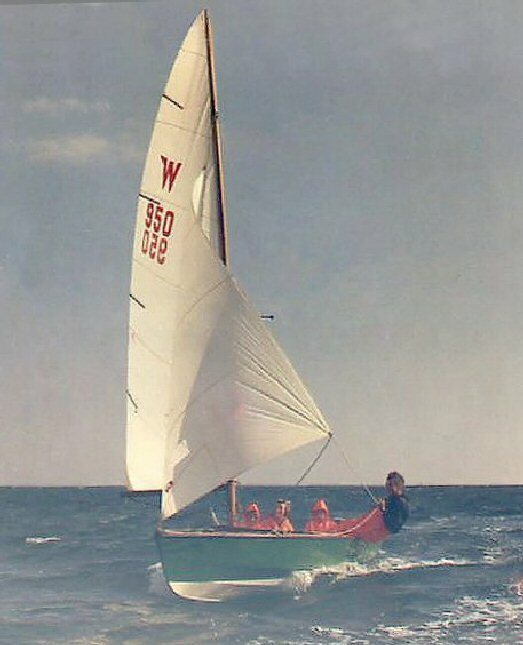 In 1976 the four of us again sailed together in Toronto, and discovered why the SC has the name it has as we had to paddle out nearly every morning to the starting line in calm, weak winds, hardly detectable due an oily film on the waters of Lake Ontario. 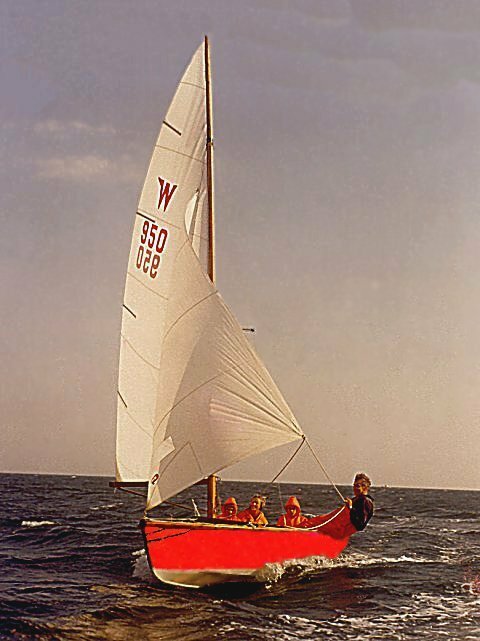 Here we used W1348's sails (the very first W. to DK in 1966 and Norway 1971). By then my wife's headaches, due to a later discovered brain tumor, were quite severe at times, but that alone do not explain we became the very last W. in the W-WCh-74. Looking back I see an epoch where probably as the only ones (ever ?) we took part being four aboard in two World-W-Ch.s! All the best to you and yours - Ken. 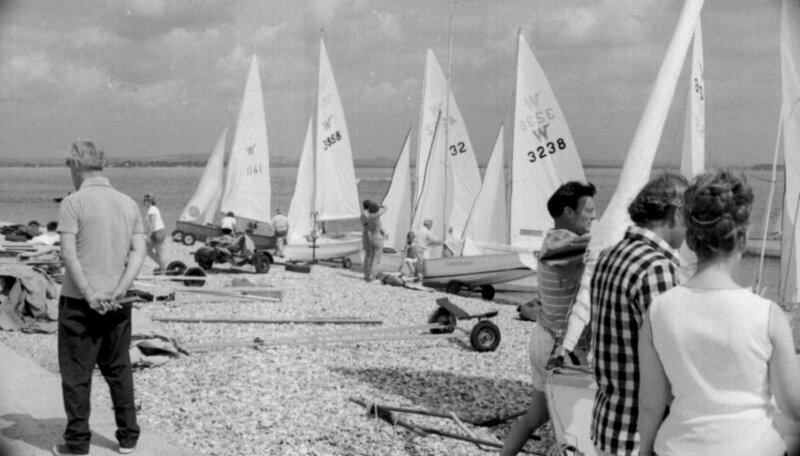 A busy place, Hayling, what with the U.K. Nationals overlapping the Worlds. 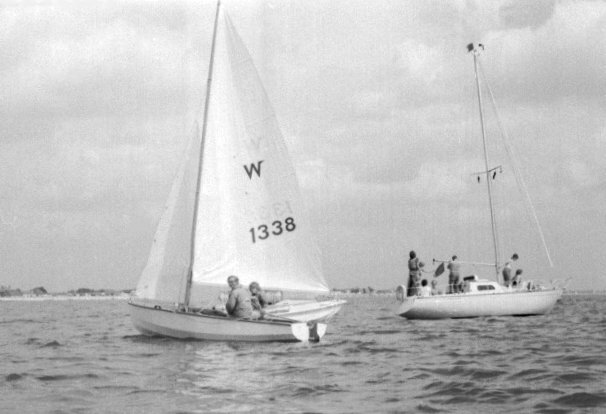 W693, Mike Lambert (UK) prepares to face the sea. 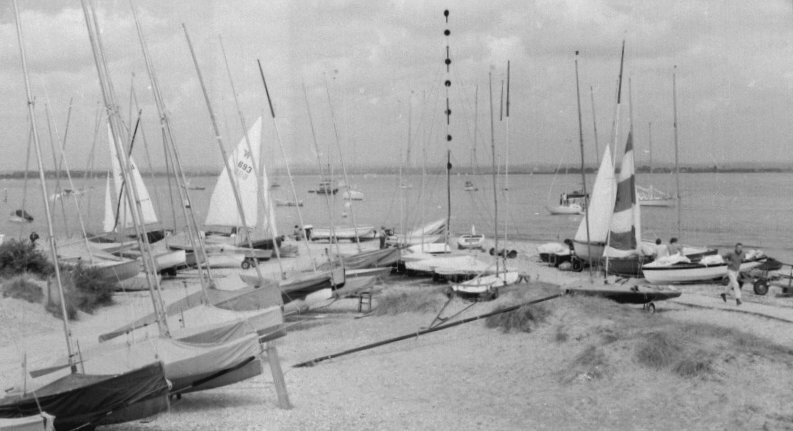 It's an uncharacteristically light air day at Hayling! 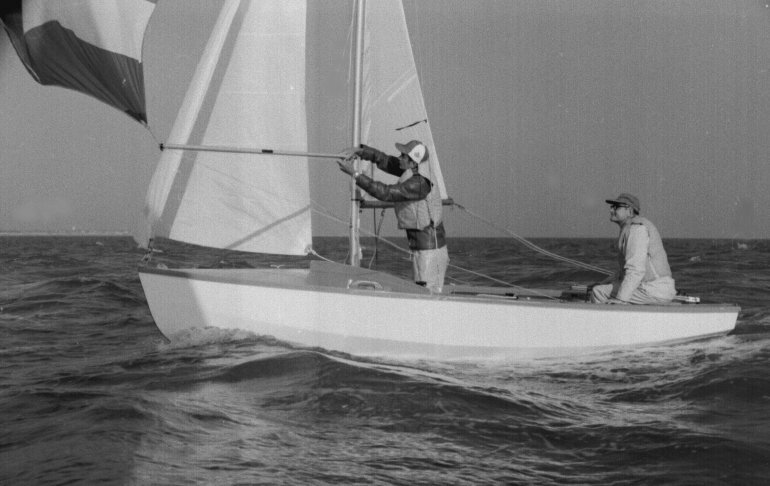 George Blanchard and Graham Dodd (partially obscured) prepare to launch. 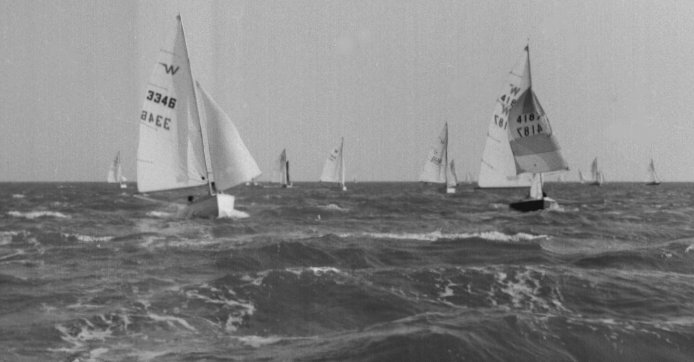 W1722 was not racing in the Worlds so that this must be one of the overlapping UK Nats/Worlds races. 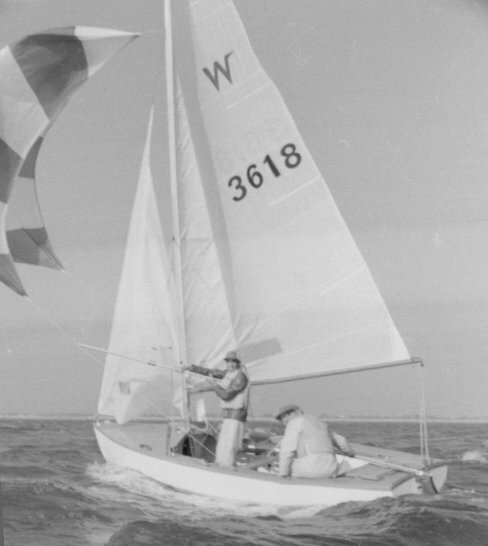 Ken Holloway (CAN) at the tiller of his borrowed W: note the stern mainsheeting and rather basic vang/kicker. 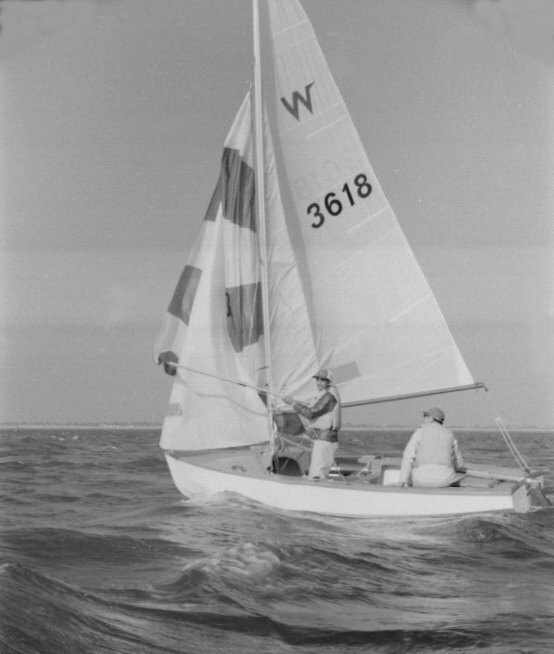 Note the "old", small, European-size spinnaker on W3238. 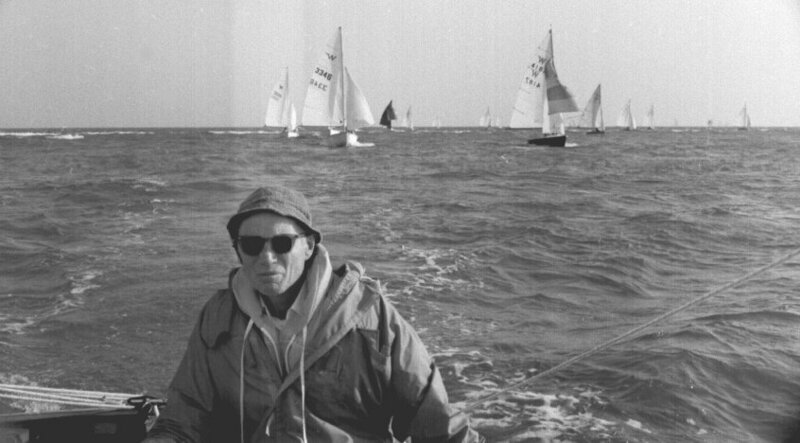 Sid Atkinson (sail 618, a left-over from his first W) hove to. but was not among the six Canadian qualifiers for the Worlds. 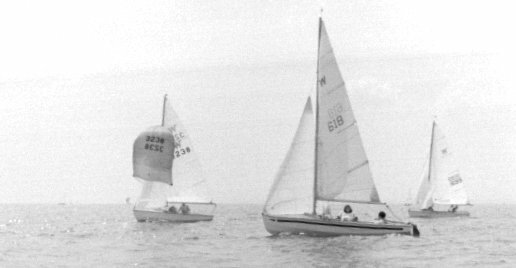 André & Michel Laframboise of Montreal, Canada with those distinctive Raudaschl sail numbers! Good thinking, André! Don't get too far from the Committee Boat on a day like this!! I do believe that's W designer, Ian Proctor, on the far right! 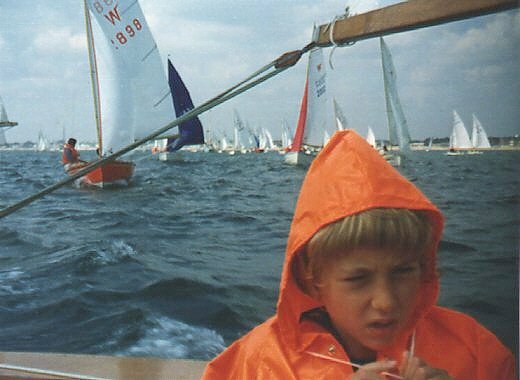 Looks like a nice hiking breeze has sprung up: Perfect conditions for North American champion, Jeff Jones (helm) and his dad, Dave, of USWA Fleet #2 (Detroit, Michigan). I believe Jeff bought W4271 here and brought it home with him. 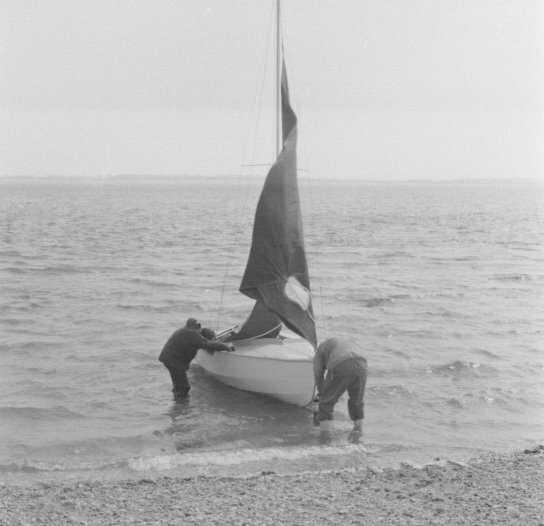 Sid Atkinson (CAN) practices his spinnaker routine under the (not so) watchful eye of CWA Chairman, Don Davis. Everything's under control - I think! 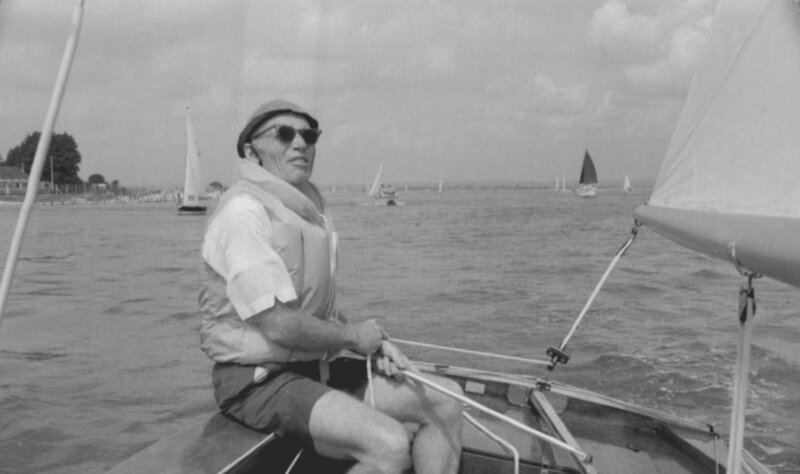 Returning to harbour via the Chichester Bar? 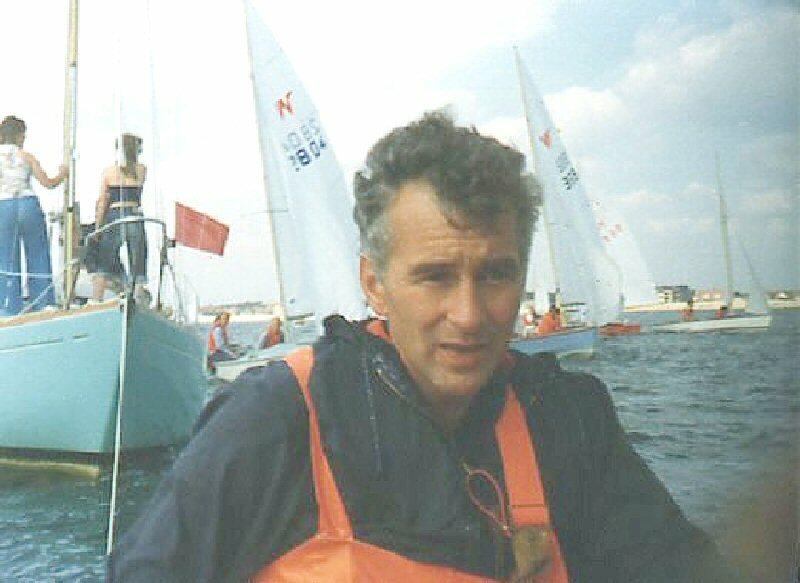 A pretty nervy guy, our Ivar, who obviously took his camera out racing!! See! Here's proof! Ken doesn't look all that pleased about it, either! 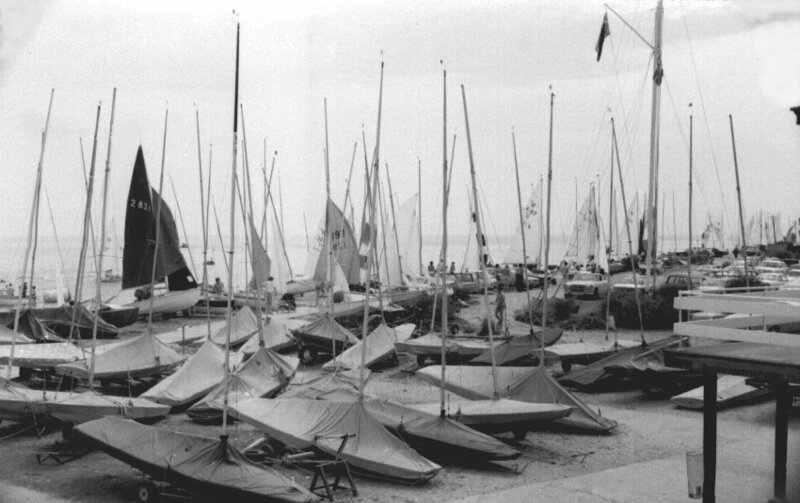 The tide must be going out: The boats are all hugging the shore. With 100 square miles of Chichester Harbour draining out through this one narrow gap, the current is appreciable!!! 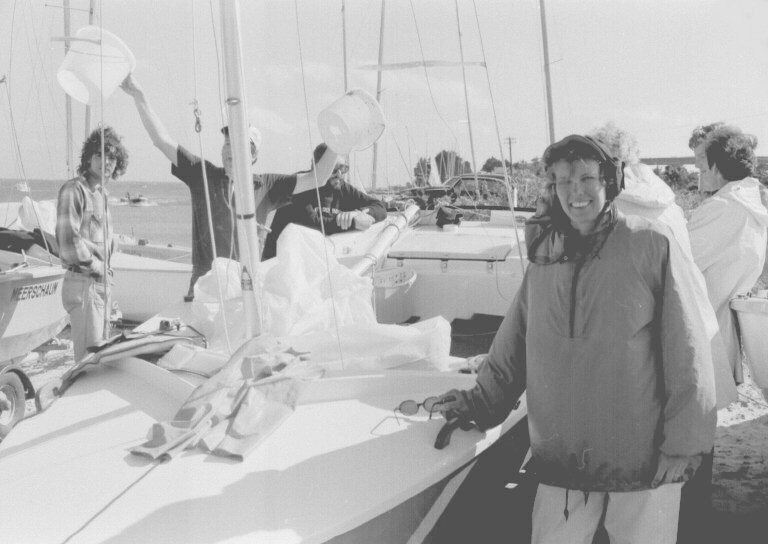 Ready to haul out at the end of a good day's sail. 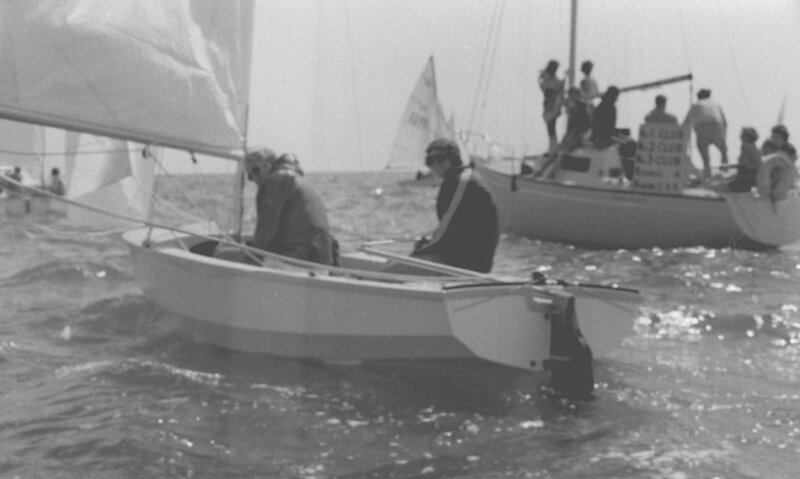 I believe that's Linda Heffernan (W611 of USWA Fleet #2) on the right, safely back from the sea.